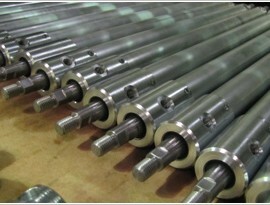 Hydraulic cylinders are an integral part of a hydraulic system. We rely on hydraulic systems in all aspects of our lives. We use hydraulic brake systems in our cars and aeroplanes use hydraulic wheel systems to land. Road repair and building construction is quicker and requires less manpower due to hydraulic systems. Our lives would be considerably slower and inefficient without hydraulics. The principle behind hydraulics is very simple and explained by Pascal’s Law which states, ‘that when there is an increase in pressure at any point in a confined fluid, there is an equal increase at every other point in the container.’ Hydraulic cylindrs are simple units whic exert a great deal of power. This is why we are able to stop a 29 tonne car using our feet. Hydraulic cylinders are sealed units made of stainless of mild steel containing a rod, sealent and presurised fluid. It is extremely important that the seal remains intact otherwise the system will not work properly. Maintaining and assessing the efficiency of hydraulic cylinders prevents them from becoming sluggish and ineffective. Pascal’s law was named after French mathematician and physist Blaise Pascal in 1647-48. The simpleset way to demonstrate the law is with two syringes connected by a tube with water in it. One of the syringes has the plunger down (first) and the other syringe (second) up creating a sealed unit. You make the plunger on the first syrning go up by pushing down the plunger on the second syringe. If the syringes are of equal size equal the force is equal if the second syringe is bigger the force increases. Most school children will be familiar with this experiment and use this simple hydraulic system to power toy cars or make lifts travel through floors in cardboard hotels. The principle is exactly the same in mechanical hydraulic systems where hydraulic cylinders apply the force. We use Pascal’s Law every day in our cars, rubbish collectors, construction machinery and a wide range of applications. Hydraulic cylinders are sealed linear units containing a piston rod, cylinder tube, base, piston, cap, wiper, rod seal,piston seal, rod bearing band, washers and wipers. It is vitally important to keep the unit air tight and clear of debris. Any dust or dirt in the cylinder will cause considerable damage and incure large costs. Here is a video showing the inside of a hydraulic cylinder. It is important to maintain hydraulic cylinders by cleaning them to keep them in full working order. Maintaing the cylinders requires them to be taken a part to be cleaned then put back together correctly. If they are not reconstructed properly they will not work and the componants may become damaged. This is a complex tax and requires experience and expertise so it is prudent to enlist the services of an engineering company to carry out the procedure. If you would like to find out more about maintaing and cleaning hydraulic cylinders contact us and we would be happy to discuss your options.